There’s nothing like owning your own fishing boat. Some folks may have fished all their lives on a boat or grew up learning on a boat and fell in love. Others may have been on the sidelines dreaming of the day that they finally got their own fishing boat to take out on the water. Perhaps you just picked up the love for the sport and started boat fishing later on in your life. No matter how or why you obtained your fishing boat, there’s nothing like fishing on a boat of your own. So when your boat is damaged or needs to be restored, it’s important to make that a priority. At Anchor Marine Repair, our focus is to restore your boat and get you back on the water as soon as possible. 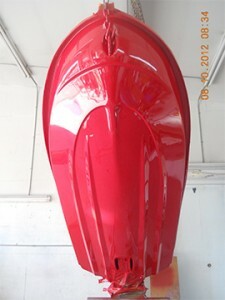 We are your fishing boat restoration company that is your one stop repair shop for all your fishing boat needs. Has anyone ever heard the Alan Jackson song, “Drive”? It talks about the first time he was able to drive a fishing boat with his dad. 18 feet, painted red with a white stripe, bought second hand and fixed up out of love. He sings about how he ran that boat for years until finally the transom got rotten and it’s something he will never forget. At Anchor Marine Repair, we understand the type of love that goes into owning a fishing boat. It’s not just the boat itself, but the memories it represents. This is why when you send your boat to us, we will go above and beyond to restore it to its original, if not better, condition. The passion that you have for your boat is one that we carry with us every day as we restore all types of boats for our customers. Had Alan Jackson brought his boat into us, that transom would be looking good as new. While we are all about restoration and recovery of your fishing boat, do not confuse us with being simplistic in our restoration. We are committed to delivering exactly what you want in your restoration. We have a state-of-the-art facility to complete the job and we use only the finest boat repair products available on the market. While each technician has been here with us for at least 10 years, we are all current on the latest technologies and techniques when it comes to fishing boat restoration. For more information about our fishing boat restoration company, give Anchor Marine Repair a call today at 763-972-3540 or send us an email at service@anchormarinerepair.com.